Chocolate, Gulkhand or Dahi, Hari Super Sandwich's fare comes with slightly eccentric but delicious fillings, and will definitely not a burn a hole in your pocket. Starting off with a small shop at Jayanagar 2nd Block in 1999, Hari Super Sandwich already has seven outlets across the city, thanks to the slightly adventurous sandwiches they offer. Head to their shop in Jayanagar 3rd Block and you might run into the owner, Shivanna, welcoming you with a smile. Named after his son, Harish, the business is managed by Shivanna and his sons. Between the sandwich shop, their chaat shop and burger joint (all at 3rd block), they get around 1,200-1,500 customers daily. Serving veg sandwiches with a desi twist, the place is a popular haunt for students and families (even film stars, we hear). Using fresh bread from their own unit in Hindupur (Andhra Pradesh), the sandwiches come in 14 different kinds, all of them slathered with lots of butter and cheese (good old Amu) slice. Once grilled (on the tawa), the sandwiches are cut into six bite-size portions. While the edges are crispened just right, the middle remains buttery and crunchy, giving way to the filling inside. We love their famous Chocolate Sandwich, where a full chocolate bar is sandwiched between bread with an Amul slice. For another appealing mix of flavours, opt for their American Sweet Corn Sandwich with diced capsicum, tomatoes, cheese and warm sweet corn. 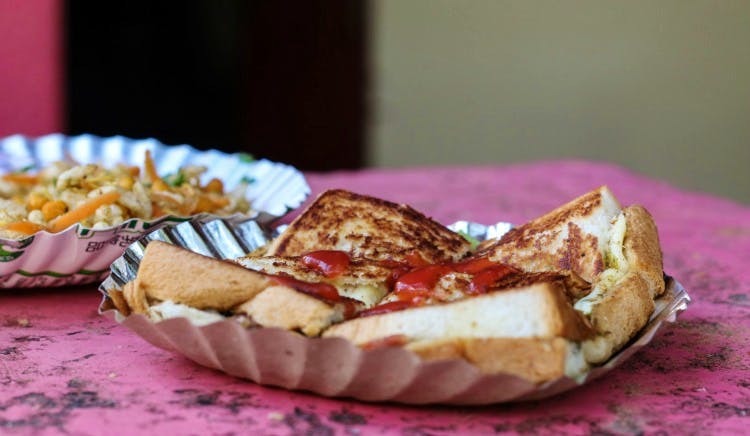 We also like their Dahi Toast varieties (Cheese Chilli Dahi Toast and Cheese Corn Dahi Toast) which comes with a dash of their special chilli chutney and topping of sev, carrots, chaat masala and coriander. Going by your mood, you can choose from their simple Sandwich Toast (bread and butter) or the veggie-loaded Hari Special Sandwich. Also on the menu are snacks like Boondhi Masala, Congress Masala and Bhel Puri, among others. Since the sandwiches are all individually under INR 100, we suggest you carry a few notes, or a few hungry people if you'd rather pay using your card. The outlets don't really have seating options, so this is the best option for grabbing a quick bite, unless you enjoy standing around and hanging out.